Heavyweight boxer and grilling connoisseur George Foreman is a car nut, amassing a collection of “more than 50" vehicles that he has to hide from his wife. Here’s a look at some of his stash. George Foreman sat down with talk show host Graham Bensinger to discuss cars, and it doesn’t take long for Big George to reveal his inner car nut. And though he does have a bunch of spicy, expensive exotics, unlike a lot of well-off celebrity figures, Foreman’s true love is something simple: a black 1977 Volkswagen Beetle convertible. I got the Volkswagen, and the other cars are just dressing around it... it’s not the most expensive, but it’s cherished with me, because you never forget where you come from. 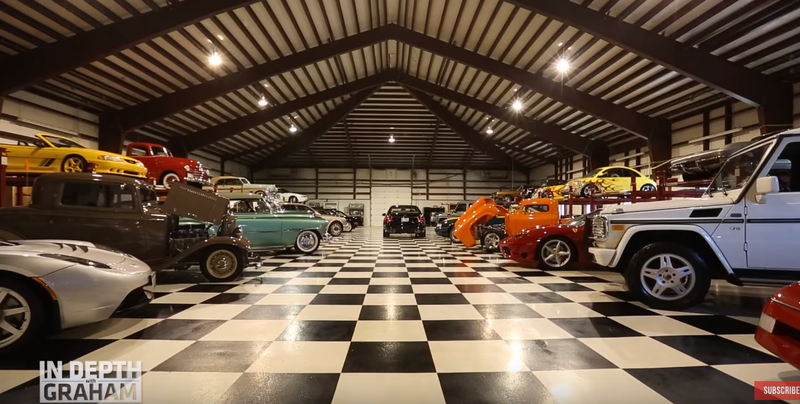 His collection is full of Chevrolets (especially Corvettes), but there are also some rat rods, an old ’50s GMC pickup, a Ferrari 360, a Lamborghini Diablo, a G-Wagen, a Ford GT, an R129 Mercedes SL and probably a whole bunch that we’re not seeing. The boxer, sadly, doesn’t drive most of these gorgeous machines, though his son, George Foreman IV (“third son, fourth George, eight child”) admits to hooning these things at speeds he probably shouldn’t mention on camera. Lucky dog.